• Describe different type chucks. Some work pieces, because of their size and shape, cannot be held and machined between lathe centers. Lather chucks are used extensively for holding work for machining operations. 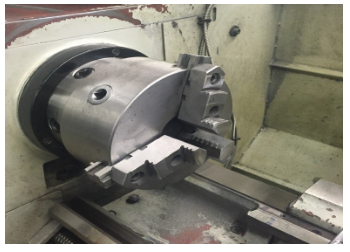 The most commonly used lathe chucks are the three jaw universal, four jaw independent, and the collects chuck. Three-jaw universal chuck is used to hold round and hexagonal work. It grasps the work quickly and within a few hundredths of a millimeters or thousandths of an inch of accuracy, because the three jaws move simultaneously when adjusted by the chuck wrench. This simultaneous motion is cause by a scroll plate into which all here jaws fit. Three jaws chucks are made in various sizes from 1/8-16 inch in diameter. They are usually provided with two sets of jaws, one for outside chucking and the other for inside chucking. This four- jaw independent chuck has four jaws; each of which can be adjusted independently by a chance wrench. They are used to held wound, square, hexagonal, and irregular-shaped workpieces. The jaws can be reversed to hold work by the inside diameter. The collect chuck is the most accurate chuck and is used for high precision work and small tools. Spring collects are available to hold round, square, or hexagon shaped workpieces. A adaptor is filled into the taper of the headstock spindle, and a hollow draw bar having an internal thread is instead in the opposite end of the headstock spindled. As the hand wheel and draw bar is revolved, it draws the collet into the tapered adaptor, causing the collet to tighten on the workpieces. The Jacob collect chuck has a wider range the spring collect chuck. Instead of a draw bar, it incorporates an impact-tightening hand wheel to close the collect on the workpiece. A set of II rubber flex collects, each capable of a range of almost 1/8 in, makes it possible to hold a wide range of work diameter. When the hand wheel is turned clockwise, the rubber flex collect is forced into a taper, causing it to tighten on the workpiece. When the hand wheel is turned counterclockwise, the collect opens and releases the workpiece. A faceplates are used to hold work that is too large or of such a shape that it cannot be held in a chuck or between centers. Faceplates are equipped with several slots to permit the use of bolts to secure the work, so that the axis of the workpiece may be aligned with the lathe centers. When work is mounted off – center, a counterbalance should be fastened to the faceplate to prevent imbalance and the resultant vibrations when the lathe is in operation. 1. What are the most commonly used lathe chucks? Name three. 2. Describe three-jaw universal chuck. 3. 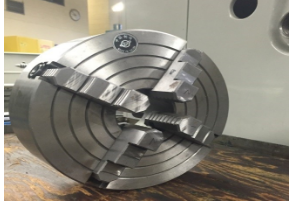 Describe four-jaw universal chuck. 5. Describe Jacobs collect chuck chuck. 6. Describe Magnetic chucks chuck.